After a short stint at Minnesota-Crookston, Jim Transferred to North Dakota. Still not gaining the eyes of professional scouts, it took an incredible banner year for the linebacker to finally get the attention he deserved. He was credited with 187 tackles, three interceptions, four fumble recoveries, 11 forced fumbles, and 20 tackles for loss in 1971, and captured Little All-American Honors for his titanic performance. – Just incredible numbers. 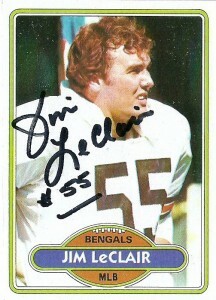 LeClair was selected by Paul Brown’s Bengals in the 3rd round of the 1972 draft, where he’d spell equally impressive Bill Bergey and primarily play special teams. While Bergey moved on to the Eagles in ’73, it was obvious that the mantle at middle linebacker soon would rest on Jim’s shoulders. By 1975 LeClair had really taken off at the position, making a career high 3 picks in 14 games that year. In 1976, Jim received his first Pro Bowl nomination. 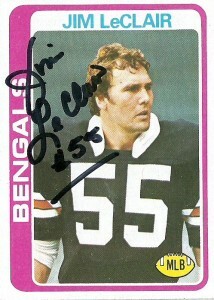 In 1980, the Bengals switched to a 3-4 defense, and Jim moved to LILB, playing for the team through 1983. 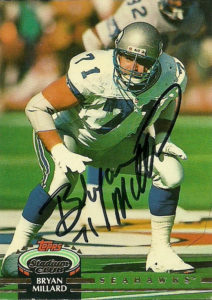 Bill by this point had been playing for 12 seasons, but still had the sport in his veins, and signed with the USFL’s New Jersey Generals. He’d finish his career there in 1984, but still manages to make it down to a game or two to cheer on the Bengals each season. He’s currently retired and lives in North Dakota, spending time as an insurance agent. Jim has done some wild stuff over his days, as an Army reservist, including wrestling a bear to a draw. Not a Chicago bear, – a real bear. He’s been a mayor and was head coach of the Mayville State University football team from 1986 – 1988. 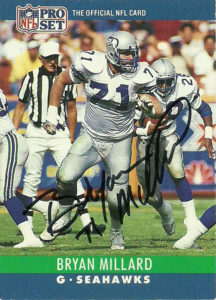 He has been inducted into the North Dakota Sports Hall of Fame and also is a 1999 member of the College Football Hall of Fame. Great cards and great find! Okay, I really think that $50.00 is way too much to pay for a player’s autograph, but for two, and the fact that it goes to charity, makes it sting a lot less. (I normally draw a hard line at $10 per card.) That was the strategy I took for the former AP quarterback, and after a long wait, it paid off. I really liked both of these releases, especially his SkyBox 1992 card, which is a sports photo masterpiece. His Action Packed is really more of a grab for a set that I like, but still it is of Jim doing something else other than cocking it back and making a throw. Over the years I’ve realized I like the offensive player photography where they are more or less alone in the frame. On defense, it’s typically the moment of impact, a big play, or looking intimidating that does it for me. So Jim Kelly finished with (a very pedestrian looking by today’s standards) 376/676 for 5228 yards 33 touchdowns to 28 picks in 44 games for the Miami Hurricanes. Kelly led a revival of the U’s program, and coming off his 1981 season everybody expected bigger and brighter things, but instead he ended up having a disastrous shoulder injury 3 games into his senior season. Still he is remembered fondly by the school and was inducted into the Miami Hall of Fame in 1992. He is considered one of the famed ‘QB class of 1983 ‘ that consisted of: Dan Marino, Todd Blackledge, John Elway, Tony Eason, and even guys like Babe Laufenberg, and Gary Kubiak. At the draft, in 1983, the Bills made the choice on the signal caller, but he opted instead to sign with the rival USFL. You see, Kelly’s rights were originally held by the Chicago Blitz, but they felt that Kelly should play where ever he wanted, so the USFL could build a stable of star quarterbacks. He went on a whirlwind tour of the league and eventually chose the climate controlled Astrodome in Houston, with head coach Jack Pardee and their groundbreaking offense. Under Pardee, the team was noteworthy for bringing the Run N Shoot to Pro Football, and Pardee went out and hired Mouse Davis as offensive coordinator to make it happen. The offensive fireworks that the team brought were nothing short of spectacular. In his first full season under center for the Gamblers Kelly threw for 5219 yards on 370 completions to go along with 44 touchdowns, earning rookie and player of the year honors from the USFL. The next year, the Gamblers became the first pro football team to utilize the No Huddle Offense. He had some great receivers too, in the names of: Gerald McNeil, Clarence Verdin, Ricky Sanders, and Richard Johnson. 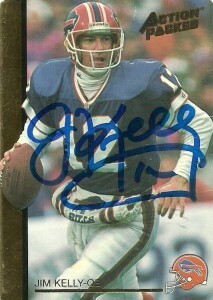 In Jim Kelly’s hot hands, the Gamblers made the playoffs in both years. Unfortunately a shift to a fall schedule before the second season (to compete directly with the NFL) doomed the fledgling league. After the season, the Gamblers were merged with the New Jersey Generals. What would have been was an incredible offense of Jim Kelly and Herschel Walker– but it never came to pass as the league folded. The NFL held a special supplemental draft, but as Jim’s rights were already held by the Buffalo Bills, he tried to engineer a trade. Eventually, Jim signed with Buffalo in 1986, pressed on by his father who wanted to live a dream of tailgating to his son’s games in Upper NY- a stone’s throw from where they lived. Although Jim lamented the outdoor cold weather of Buffalo, he proved himself wrong, by really turning the team around and becoming the centerpiece to the Bills attack. 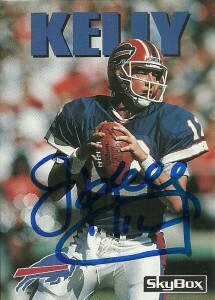 Kelly quickly became adept at the Bills No Huddle Offense, – nicknamed the ‘K-Gun’. Few teams’ defenses could keep up with the Bills no huddle attack, and by 1988 (with the final addition of Thurman Thomas,) the Buffalo Bills were the premiere team in the AFC. Jim had some awesome weapons in Andre Reed and later also, James Lofton, but among the ones that was overlooked the most was his center- Kent Hull who played with Jim (technically) since Kelly’s days with the Generals. With Jim at the helm the Bills won 4 AFC titles in a row from 1990- 1993, but never won a Super Bowl title. 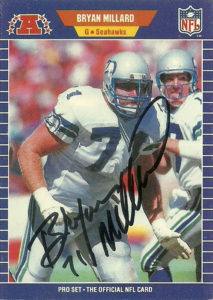 Still Kelly earned a heaping of accolades and All Pro awards until his retirement after the 1996 season. His number has also been retired by the Bills and he was inducted into the Pro Football Hall of Fame in 2002. 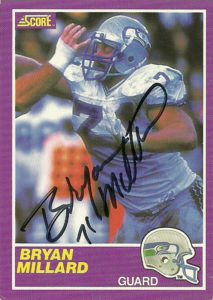 He also dabbled in broadcasting briefly, handling WLAF color commentary for the USA Network back in 1991 and 1992. Combining Jim’s USFL #s with his NFL numbers gives him well over 45,000 career passing yards and 320 passing touchdowns. His number has also been retired by the Bills. Jim has spent a great deal of his time giving back to the community, as his son tragically passed away from Krabbe Disease, in 2005. He also spends much time working football camps for children in Upper NY and is dedicated to keeping the Bills in Buffalo. You can write him courtesy of Hunter’s Hope Foundation with a donation for his autograph.